"Guidelines for FIG to Enhance the Involvement of Under-represented Groups in Activities of FIG and to Implement Gender Mainstream in FIG's Work"
The Workshop takes place Wednesday April 16 11:00-12:30, Commission 1 Room and is open to all Working Week participants. One of the Working Group specific projects is to provide guidelines for FIG. These guidelines should be presented in 2006 during the FIG Congress in Munich, Germany. How to increase the participation of more countries in the work of FIG by recognizing the importance of cultural issues and linguistic differences? How to enhance fair competition for minority groups? How to get more information about the participants of FIG congresses and Working Weeks? How to intensify the work within the FIG Commissions to support women and cultural and language minorities? How to implement Gender Mainstreaming in FIG’s work? How to increase the number of female delegates and Commission chairs? How to increase the number of young delegates? How to encourage a multicultural and gender balanced Council? How to enhance equal opportunities for individual members within FIG, not depending on gender or native language or other cultural characteristics? The international surveying community is mourning the loss of Dr. Mary C. Feindt, PLS (Michigan), who passed away on January 29, 2003 following an extended bout with cancer. Mary (Bastian) Feindt was born in Chicago in 1916 and grew up in Albion, Michigan. She was the daughter of Ernest H. Bastian and Lila M. (Waitt) Bastian. Records indicated that Mary is most likely the first woman to have become a registered land surveyor in the state of Michigan. 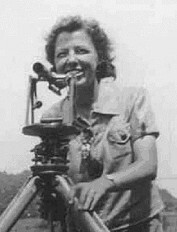 She received her license in 1942, four years after graduation from the University of Michigan with a Bachelor of Science in Geodesy and Surveying. She also held a Bachelor of Arts degree from Albion College, and a Master of Science in Civil Engineering from the University of Michigan, a degree she had gone on to earn in 1944, the same year that she became owner and president of the Charlevoix Abstract and Engineering Company in Charlevoix, Michigan. In 1999, Mary received an honorary doctorate from Ferris State University, where she had helped to organize a surveying department and had served on its industrial advisory committee. Her mission was to provide insight for the faculty, so that classroom teaching would accurately reflect the real world of the practitioner. In 1993, the College of Technology recognized her with an award for outstanding service. Until her recent illness, she had continued to work full time with her company, and she had continued to hold the post of County Surveyor, a position to which she had been continuously re-elected since 1948. Additionally, Dr. Feindt testified in court as an expert witness on land surveying and title examination issues. Dr. Feindt served the American Congress on Surveying and Mapping (ACSM) in a number of capacities, including the position of liaison to the American Land Title Association (ALTA). As late as 2002, she continued that commitment, travelling several times each year to national conventions and meetings for both organizations. Together, ACSM and ALTA produce and publish surveying standards that are considered the highest in the nation. With Mary’s help, the standards were regularly updated and clarified. She had earned several Presidential Citations from ACSM, the most recent bestowed in 1999. However, as early as 1987, the Michigan Land Title Association honoured her many contributions to the profession by establishing the Mary C. Feindt Award, given to those who exhibit professional dedication similar to hers. When Dr. Feindt received the honorary degree at Ferris State, one of the highlights of her address was her rendition of the recently popular joke about three men who discover a genie and who then each receive the proverbial wish. In turn requesting to become increasingly intelligent, the first two men are pleased with their newly enhanced brain power. The third man, however, asks for so great an increase in intelligence that the genie must turn him into a woman in order to grant the wish. Mary’s steadfast support of women’s issues allowed her to be a mentor for several generations of women in surveying. Her own granddaughter has also followed Dr. Feindt into the geomatics profession. In 1983, Mary became a co-founder of ACSM’s Forum for Women in Surveying and was elected the Forum’s first chair. Under her watch, and in spite of a conservative backlash from some members of ACSM, the Forum established advertising guidelines that remain in use today, eliminating sexist advertising and curbing gender bias in surveying journalism. When the Forum was born, trade journals were full of surveying instrument ads featuring women in swimsuits, negligee, or less. The national association for surveyors was only one percent female. That number, while still embarrassingly small, has more than quadrupled in the past twenty years. Known for her patience and forbearance, Mary was able to facilitate dialogue among opposing groups on various subjects within her profession. She said that she had learned her coping skills by attending engineering school at a time when women were most unwelcome in such settings. Her many instructors and administrators, attempting to persuade her to drop out, warned her that surveying was not a field for women. Had it not been for the steady encouragement of her father and one professor, Mary said that she might have given up. Later, it was her husband J. Lawrence Feindt who supported her goals, and they worked together until his death in 1988. She was joined in the business by her son Larry and his wife Faye. Her stepson C. Fred Feindt (now deceased) was also a member of the business in the 1970s and 1980s. Her granddaughter Amy Feindt has most recently joined the practice, which is now known as Advanced Geomatics. Mary was active in her local community and had been involved with the Charlevoix Area Chamber of Commerce since its inception. She was an avid member of her local Charlevoix Downtown Development Authority and a member of Zonta International of Charlevoix. Happily representing surveyors at international conventions, Dr. Feindt presented an image that would have put her doubting professors to shame. Persistent yet kind, Mary was known as a strong and mostly solitary person who greatly respected and enjoyed her colleagues, and who deeply loved her family. She is survived by her son Lawrence R. Feindt, daughter-in-law Faye A. (Whitley) Feindt, her sister Lois Metzler, and three grandchildren, Amy C. Feindt, Rene P. Feindt, and Jacob H. Feindt. She is also survived by three great grandchildren, Christine and Isaac Zeitler and Jesston Whitley. The family suggests that memorials be given to the Mary C. Feindt Surveying Scholarship c/o Debra Jacks at Ferris State University, 330 Oak West 100, Big Rapids, MI 49307; the Mary C. Feindt scholarship for women entering the fields of mathematics and science at the Charlevoix Zonta Club; or to her home church, the First Congregational Church of Charlevoix. Gabriele Dasse, active member of the German association DVW was elected in February 2003 as Chair of the DVW Working Group 1 “Profession”. She is the first woman in this position since the foundation of DVW in 1871. Starting this year with a new period the DVW Working Group 1 now covers the fields of work of FIG Commissions 1 and 2. The fields are: practise, professional education, continuing professional development, women in DVW, organisation and legal aspects. During the last period Gabriele was member of the old Working Group 1 and has been chair of the DVW Working Group “Women in Surveying” since 1995. As Working Group chair in DVW Gabriele is as well delegate to FIG Commission 1 . This gives her the possibility to continue as chair of the Joint Commission Working Group on Under-represented Groups in Surveying (Working Group 1.5 of Commission 1), a assignment Gabriele took over during the last period 1998 - 2002 as chair of the Task Force with the same name. Another member of the German Working Group “Profession” will take over the delegation to Commission 2 in FIG. After 17 years working as a surveying professional she left this arena last year and works now as the assistant for the head of the Department for Civil Engineering and Transport in Hamburg, one of the Federal States in Germany.